Basic Information: What is Athlete’s Foot Spray? Below is the review of CVS Athlete’s Foot Spray. This spray can be used cure most Athlete’s Foot. This product can also relieve the burning, itching, cracking and scaling of your feet. By continuing on, you can learn the active ingredients in this spray and find information to help you determine if this spray is right for you. Miconazole nitrate is the sole active ingredient this spray contains. It is antifungal and can kill the fungal infection causing your Athlete’s Foot. Children can use this product as far as we can tell although you should supervise your children closely in the use of this product in case they have an adverse reaction to it. If you are allergic to any of the ingredients listed above then you should not use CVS Athlete’s Foot Spray. The area affected must be washed and dried thoroughly before using the spray on it. Make sure you shake the can well before spraying a thin layer over the area to be treated. This should be done twice a day in the morning and night, unless your physician has directed otherwise. You should pay attention to the areas between your toes and take measures to aid your condition such as wearing shoes that fit well and are well ventilated and changing your shoes and socks on a daily basis or you may slow your recovery. You should continue to use this product on a daily basis for four weeks in the case of athlete’s foot and ringworm, or for only two weeks for jock itch. 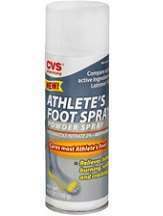 Athlete’s Foot Spray can be bought from CVS. A 5.3oz bottle costs $8.99. Compared to some other products on the market, this price is reasonable. Having used this product for over a month, I found that my athlete’s foot had greatly improved. I used it for a bit longer than you are supposed to and found that I did not become infected again once I stopped using it. The product works but it has the unfortunate drawback of having a disgustingly strong smell when you use it. You will want to use it in a large well-ventilated space if you want to avoid breathing it in too much but even then, the smell can linger afterwards. This spray may dry and irritate the skin because of its alcohol content. You should keep a close eye on your skin as you use this product in case any problems develop. If your condition does not improve after 4 weeks of use, then stop using it and see your physician. If your condition worsens or has any adverse side effects, then cease using it immediately and seek the aid of a medical professional. You should not use this on a child under 2 years of age and this product has to be kept out of the reach of children as well. You should be aware that this is highly flammable as well, so make sure you do not use it or store it in unsuitable conditions. This manufacturer has a 60-day guarantee. You can either return the item to the store where you bought it or return it directly to the manufacturer if you bought it from them originally. The guarantee is valid for 60 days after receipt of the product. You can return the product opened or unopened as long as you include your receipt or invoice as well. When returning it by mail, you must first contact Customer Care at 1-888-607-4287. The feedback provided on the manufacturer’s website is limited as only one review could be found. This reviewer was pleased with the price and effectiveness of the product but was displeased with its smell. Overall, they were happy with it although there are not enough reviews to reflect overall satisfaction with the product. The most important positive of this spray is that it does work. It may smell extremely unpleasant but it does what it claims to do. The application of the product is straightforward and the price for that amount of product seems to be good value. The manufacturer’s guarantee means that it is easy to return the product for a refund. However, the product is not entirely good as it has its drawback. Its odor would put off many people and would be something that you would have to put up with twice a day for an extended period of time. Additionally, the spray can cause new problems. The alcohol content of CVS Athlete’s Foot Spray can dry out the skin and irritate it, which would only make the experience of having Athlete’s Foot even more unpleasant. How effective the product might be for the majority of people is unknown as there are too few reviews to gain a proper insight into this. Overall, while this spray appears to work it might prove unsuitable for some people’s needs.